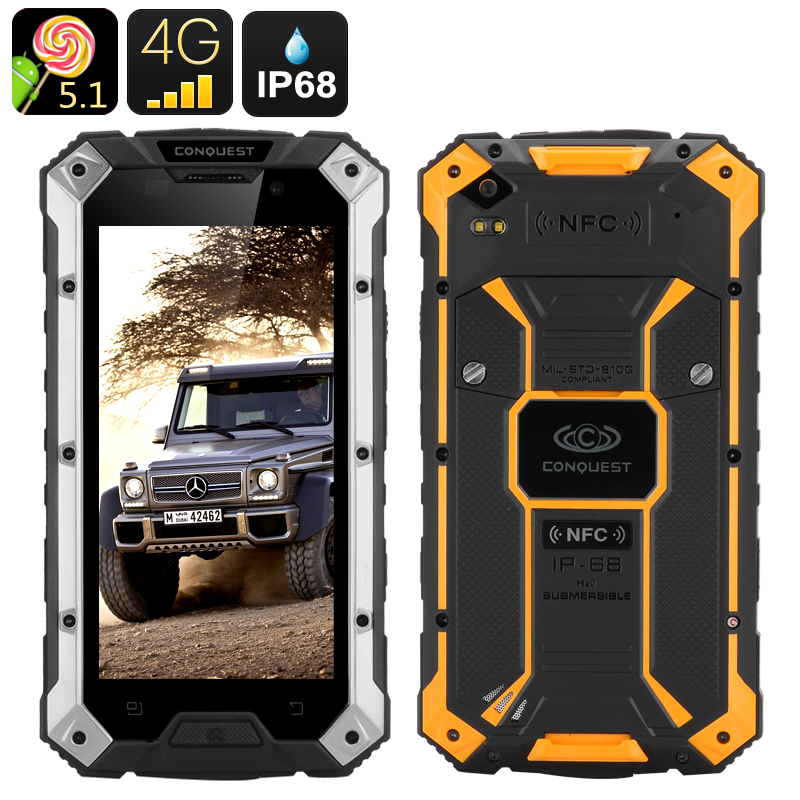 Successfully Added Conquest S6 2GEN Rugged Android Smartphone - 4G, 5 Inch 1280x720 Screen, 6000mAH Battery, NFC, OTG, 3GB RAM (Silver-Yellow) to your Shopping Cart. With IP68 rating, the Conquest S6 2GEN is a rugged smartphone that is waterproof, shockproof and dust tight. Featuring Android 5.1, a 5 inch HD screen and 4G connectivity on two SIM cards, it’s not only tough but also full of great functionality. The Conquest S6 2GEN is an improved version of the popular rugged smartphone. It now comes with 64GB of internal memory and a large 6000 mAh battery (16 hours of continuous talk time + 700 hours on standby). The phone’s 5 inch HD screen is protected with Corning Gorilla Glass and is a great for watching videos and browsing the web. With 4G connectivity, you can also benefit from super fast web speeds. What's more, you will be able to enjoy them on two SIM cards and have separate mobile accounts on one device. Android 5.1 brings with it a familiar interactive interface and access to the Play Store, while the MTK8752 provides a strong base for multitasking and gaming. Bluetooth 4.0 ensures efficient communication with other devices, and you will be able to hook up external speakers, Bluetooth headphones and more. Plus, the smartphone comes with its own built-in FM radio to entertain you on hiking trips or other outdoor adventures. You will have to cameras to snap fun selfies or take pictures of the scenery around. Thanks to the support of NFC, the smartphone offers quick file transfers on the go with NFC-compatible devices and can also receive over-the-air software upgrades thanks to OTG.